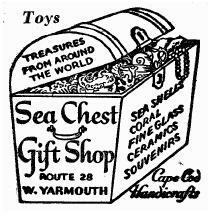 The treasure chest shaped building is still there, in West Yarmouth, but the location has seen many different businesses since it was the Sea Chest Gift Shop. This image has been viewed 8306 times and no comments have been submitted yet. You may leave a comment about this image. You can also view more Retro and Cape Cod images or learn more about Cape Cod.